Precious cargo on his shoulders: a firkin is carried to a brewer's booth, at the Northern Virginia Summer Brewfest, just outside of the city of Leesburg, in northern Virginia. A firkin is 10.8 gallon (US) beer cask. More about cask ale and zwickelbier at the Northern Virginia Summer Brewfest: here. Review of the festival from Musings Over A Pint: here. See more photos from the festival: here. Pic(k) of the Week: one in a weekly series of personal photos, usually posted on Saturdays, and often of a good fermentable as subject. A zwickel is a sampling valve on the side of a beer fermenter or maturation tank. A beer poured from a zwickel on a maturation tank is called a zwickelbier (German spelling). Brewers (sober! ), may refer to this as zwickel-teasing. Zwickelbier usually is not very carbonated, and, because it hasn't been filtered, will contain yeast. Brewers will sometimes rack (transfer) the beer directly into casks and serve it as is. Also referred to as kellerbier, this is obviously as fresh as a beer can be ... when served and consumed immediately! This photo was taken at the Mad Fox Brewing Company in late June 2010 (and is reproduced here by permission.) The beer is an American Pale Ale, and it's the first beer ever poured at the brewpub, which is scheduled to open in mid July 2010. In the comments below, two readers pointed out inaccuracies in what I had written, or as Alan put it, a quibble over a zwickel. Their observations were significant enough that I've amended my post. Real Ale —also known as cask-conditioned ale (or lager) is unfiltered beer that has undergone a final fermentation WITHIN a cask, and then served from that cask, without extraneous gas pressure, either pumped from the cask by hand, or by simply opening a tap which has been hammered into a bung. 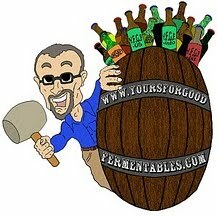 Think of a cask as a fermenter (albeit a small one) containing active, still fermenting, beer. That's fresh! Since zwickelbier is beer which is served from the vessel in which it was fermented (in this case a brewery fermenter), it could in a sense be considered real ale (or real lager). If the fermenter is bunged (sealed) at some point near the end of fermentation, the beer will be carbonated. It may be cloudy, from proteins in solution and suspended yeast . Suffice it to say, however, that simply racking (transferring) unfiltered beer into a cask does not make it cask-conditioned real ale. Some craft breweries in the US have been known to do this. Not so Bill Madden —Mad Fox's brewmaster— a passionate advocate for cask-conditioned ale. At the Northern Virginia Sumer Brewfest, today and tomorrow, Madden will be pouring his American Pale Ale zwickelbier. 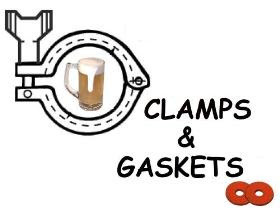 At his blog, he very carefully explains that it will not be cask-conditioned ... but that it will be fresh. It will be the first public sampling of Mad Fox beer brewed on-site. The [kellerbeir] will be gravity served out of firkins [10.8 gallon casks], but this is not proper Real Ale or Cask Ale. There will be no secondary fermentation or finings used. You’ll have to wait until Mad Fox opens and the Real Ale has matured in casks for that experience. Years ago, at the Oxford Brewing Company (my first professional brewing gig), brewer Dan Carter showed me how to pull samples from the outflow side of the filter. He taught me how to examine the beer for color, consistency, and flavor. The process included measurement and organoleptic analysis. Another way of saying this: we tasted the wonderfully cold, fresh beer. Dan called the sampling port a "happy valve." Indeed! Photos from the Northern Virginia Summer Brewfest: here. Castelvetrano olives are all the rage these days, and should be. These Sicilian green olives are fruitier and less briny than the 'average' green olive. And, at Secco Wine Bar, they are but one appetizer on a creative menu. Located in Richmond's Careytown district, Secco is itself is all the rage. Intimate in size, hip but inviting, it's been packed nightly since opening in May. On a recent Sunday evening, two beer bloggers and their friends were reserved a table for "collaborative research." A wine bar yes, but with good beer and food as well (or, as the website puts it: "a European-style eatery for exceptional everyday dining, from the folks at River City Cellars"). Among (more than a few) beers we drank, La Douze ―celebrating the 12th anniversary of Swiss brewery Brasserie des Franche Montagnes (in the photo next to the olives)― was a draught standout. Zesty, lemony, yeasty (cloudy), spicy, and 6.5% alcohol by volume. The brewery mentions the use of salt to make the beer. Odd, since most breweries in fact routinely add brewing salts (including sodium chloride) to their brewing water in order to bring out flavor, and assist yeast fermentation. As good as the beer was, we found those fried olives nearly addictive. We ordered three times. Read more about our "collaborative research" from Eric Delia: here. View more photos: here. And, read a report of my pre-opening tour, led by owner Julia Battaglini: here. Thank you to Julia for reserving the table for us. I freely admit my bias! vegetarian cooking and food issues. Twitter #FollowFriday: For news of the Northern Virginia SummerBrewfest, 26/27 June, in Leesburg, follow this hashmark - @novabrewfest. Twitter #FollowFriday: beer book authors. 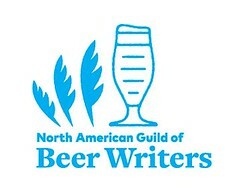 @lucybeercook, @CharliePapazian, @Cicerone_org, @PeteBrownBeer, @lewbryson, @StanHieronymus, @thebeerchicks, @maureenogle. Last night, I forgot the cranberries. I was the guest speaker at a beer-with-cheese tasting, a charity fundraiser. Just before begining, I silently reviewed my talking points. How is beer made? How is cheese made? Why pair cheese with beer? Do your beer a favor: drink it fresh, and drink it from a glass, not from a bottle. If you drink beer from a bottle, you won't be able to smell the aromas, a major contributor to flavor. To facilitate the last point, I will often bring 5 ounce dessert wine glasses to a beer tasting. The bulb holds 4 ounces of beer, a good sample size when several beers are to be tasted. The taper concentrates the aromas. The flare allows the drinker to smell the aromas (without dipping a nose into the beer!). But last night ... I had forgotten the glassware. The host (the event was held in a private home) graciously pulled out 20 or so wine glasses, and the tasting proceeded. On the right: a triple-creme, to be served with Allagash White. The clue is in the name. A triple-creme or cream has a high concetration of butterfat. The acidity and coriander spice of the beer both cuts through and sits well with the cheese. On the left: a 3-year aged Gouda, to be served with Brooklyn Lager. Aged Gouda's sweet caramel nuttiness plays off the slightly sweet toasted notes of the beer. Danish Blue, served with Abita Turbo Dog (brown ale). Even though the beer has a dark caramel sweetness, its roasted notes soften the 'funk' of the blue cheese, and vice-versa. Humboldt Fog goat cheese, served with Duchesse de Bourgogne (Flemish sour red ale). A deliciously tangy cheese, the Humboldt Fog tasted appropriate against the tart almost cherry-fruity character of the Belgian beer. This pairing elicited the greatest number of comments: some quite favorable, some not so. Époisses (washed rind cheese), served with Heavy Seas Loose Cannon Hop3 (IPA). The, shall we say, 'stinky' aromatics of the cheese mated well with the pungent aromas of the American hops. Oh, yes, about those cranberries. For almost every childhood Thanksgiving I can remember, as we would push ourselves, sated, from the table, the meal ended, our mother would call us back: "Oh, I forgot the cranberries." We'd sit back down, and eat some more. Whether intentional or not, this ritual seemed to repeat itself every year. It became a family mantra for "be prepared." Last night I forgot the cranberries, that is, the beer glasses, again. The book in the above photo is Tasting Beer by Randy Mosher. It's an instructive and entertaining primer on just that. Caveat lector: As an employee of a beer & wine wholesaler in northern Virginia, I sell the beers of Allagash, Brooklyn, Abita, and Heavy Seas (but not Duchesse de Bourgogne). My grandmother loved hosta plants; they ringed her Brooklyn, New York, house, front and back. We, as kids, would call them Nana plants. Many years later, hosta ring my backyard; several of the rhizomes were originally dug from Nana's garden. Now, as they bloom in late June, I think of her, and smile. See a slideshow of the entire set, picturing the hosta as they grow from tiny buds in March: here. There was a door prize for members of Giramondo Wine Adventures at last evening's Beer 101 lecture, in Washington, D.C.
Cabot Creamery, a Vermont dairy farmer's cooperative, donated a gift pack of its cheddar cheeses. The pamphlet includes a recipe for Welsh Rarebit. Clipper City is now known as Heavy Seas Brewing. The McHenry Lager in the pamphlet is now known as Heavy Seas Classic Lager. Caveat lector: As a representative for Select Wines, Inc., I sell the beers of Heavy Seas in northern Virginia. #FollowFriday: Search (and follow) these hashtags for beer news in Washington, D.C., Maryland, and Virginia: #DCBrews, #MDbeer, #VAbeer. Beer Birthday: Ray Daniels http://bit.ly/dzzrUt. The preeminent beer educator today. A Twitter welcome to @dcbrau, soon to be Washington D.C.'s first production brewery since Huerich closed in 1956. A Twitter welcome to @PortCityBrew, Port City Brewing, an artisinal brewery coming to Alexandria, Virginia, in late 2010. The smells and sounds of a recent moonlit early morning brought about a visceral memory. Of all things, it was of long-ago childhood summers, when as a paperboy, I would awake before sunrise to deliver the Washington Daily News (itself now only a memory). When a person's avocation becomes a vocation, the reasons why one appreciated the thing in the first place can become obscured. An occasional refreshment is required. For me, that can be sipping a good beer. If I'm lucky, that simple (?) act can bring back a memory of a thrill when, years ago, I first understood the beauty of good beer. Next week, I'll be teaching Beer For Beginners, a seminar sponsored by Giramondo Wine Adventures. It would be a visceral victory if I could help the participants —most of whom prefer wine— to understand, and maybe, experience, that pleasure of a good beer. What is beer? How is it produced? The 4 basic styles of beer. What are the flavors of beer? How does one critically taste beer? Is it like tasting a wine? Beer and food pairing: is beer the 'new' wine? As with food, FRESHNESS is paramount. We will taste great beers from around the world with Beer Master Tom Cizauskas who is also a renowned beer speaker having presented at tastings, festivals, and breweries. Stay tuned for the beer selection that will include craft beers of different styles and origins! The tasting will be accompanied by a selection of cheeses, donated by Cabot Dairy of Vermont. Caveat lector: As a representative for Select Wines, Inc. of northern Virginia, I sell the beers of Brooklyn and Heavy Seas. Sometimes, it's not about the yeast strain, or the barley type, or the hop varietal. Sometimes, it's not about the IBUs, or the OGs, or the SRMs, or the ABVs. Sometimes, it's not about the latest and the greatest ... but simply about sharing beautiful beer on a beautiful day. And, so it was on on a drop-dead gorgeous Saturday afternoon, outside on the deck at Legend Brewing Company, overlooking the James River, in Richmond, Virginia. Two beer drinkers, with their dopplebock and 'Belgian-style' pale ale. That's what it's all about. Now, cue Burt Bacharach. Repeating myself: I posted this once before, but not as a Pic(k) of the Week. I think it catches the essence of my "love affair with beer."